It's no secret that American women are killing it at the Rio Olympics — from Simone Biles to Katie Ledecky, women athletes are simply outshining their male counterparts at the 2016 Games. While the women athletes' success certainly doesn't come as surprise, what does is that finally, women's sports are receiving the attention they deserve. According to The New York Times, women are dominating primetime Olympic coverage, albeit sexist coverage. 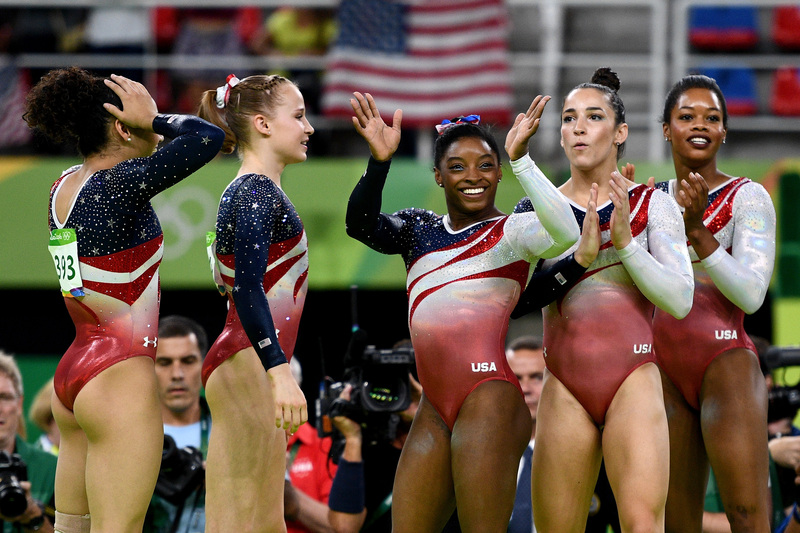 Nearly 60 percent of NBC's primetime Rio Olympics coverage so far has featured women's sports, which is coverage that the women athletes totally deserve. The United States' women Olympians have certainly earned their primetime slots. As of Aug. 15, U.S. women have earned 36 medals in Rio, 16 of which are gold, according to Associated Press. Male athletes representing the United States have won 32 medals, only nine of which are gold. This is not the first time women's sports have dominated Olympic primetime coverage: Women's sports received more primetime coverage the men's sports during the 2012 London Games, too, The New York Times reported. However, even in 2012, women did not receive nearly as much coverage as they have this year. Recognizing women's sports with primetime the coverage they deserve is undoubtedly important. However, Andy Billings, a sports media professor from the University of Alabama (who conducted the study that found women are dominating primetime coverage at the 2016 Olympics), made an important point: Women's sports are being covered, but the coverage can be pretty sexist. First of all, Billings pointed out that the women's sports receiving the most primetime coverage (over three hours each) are gymnastics and volleyball — sports for which the athletes wear leotards and bikinis, respectively. However, the U.S. women's gymnastics team has been practically unbeatable, and the volleyball teams have done quite well in Rio, too. So yes, women athletes are getting their fair share of NBC Olympics coverage, but the focus is on sports in which women wear leotards and bathing suits. And, on top of all that, it's not as if the coverage isn't sexist. For example, Huffington Post reported that during a qualifying women's gymnastics round, an NBC commentator said that the U.S. team was milling around during the event, and "might as well be standing in the middle of a mall." And then there's champion swimmer, Katie Ledecky, who is constantly compared to Michael Phelps, as if every successful woman athlete must be compared to a male athlete. Many women Olympians are fighting back against the sexist coverage, and Simone Biles, who's headed home from Rio with a whopping five medals (four of which are gold), is one such athlete. After she won the all-around women's gymnastics competition, Biles set the record straight and told reporters, "I’m not the next Usain Bolt or Michael Phelps. I’m the first Simone Biles." In a year during which women are so clearly dominating the Olympic Games, Biles should not have had to remind commentators that women athletes shouldn't be discussed in relation to their male counterparts. Women's sports receiving deserved coverage is a step in the right direction, but it's time for that coverage to stop being so sexist.